– Boughey bay off Havannah channel. Not really part of the Broughtons, but close enough. 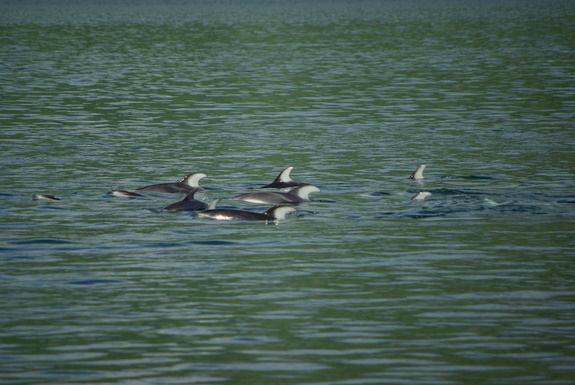 We were visited by a school of feeding porpoises, who circled nearby us for probably 30 minutes. We were enchanted. – We was actually sailed downwind through the narrow passage at Root Point in Chatham channel. It’s tricky enough because the passage is very narrow and you must stay aligned with the onshore range markers or go aground. We added the risk of jibing the mainsail in the downwind sail, but we couldn’t resist sailing after too much motoring the days before. – We followed Tribune channel, spending one night at Thompson Sound, where to our surprise there was a private cabin near the river. We also spent one night at Wakhana bay. The forest there seemed very dark and foreboding, with rat-like creatures prowling the shore. We dubbed it “Mordor”. Back on Tribune Channel again, “Lacy falls” were completely dry after a hot September. – Viner Sound was lovely! To our surprise, there were a couple of a mooring buoys in the south cove near the head of the sound. We spent two days there, in part because the weather had turned on us and now it was raining with no wind, rather than being hot and sunny with no wind. 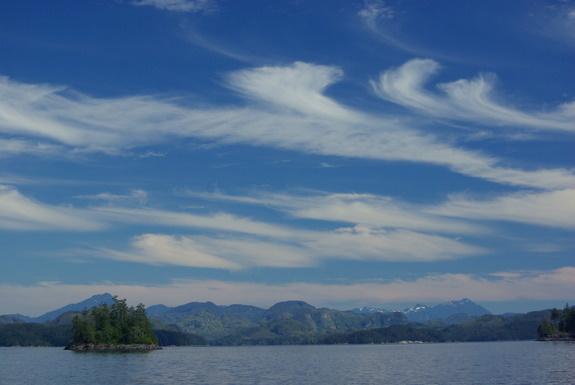 – Waddington Bay was another wonderful spot where we stayed for 2 more days. 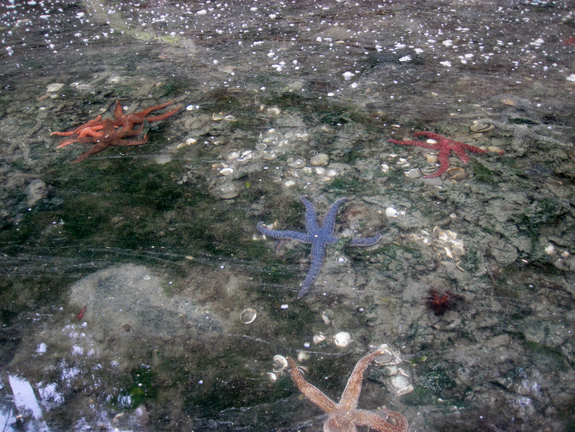 We had a nice row around the island in the center of the bay, and saw lots of lovely starfish in the water. 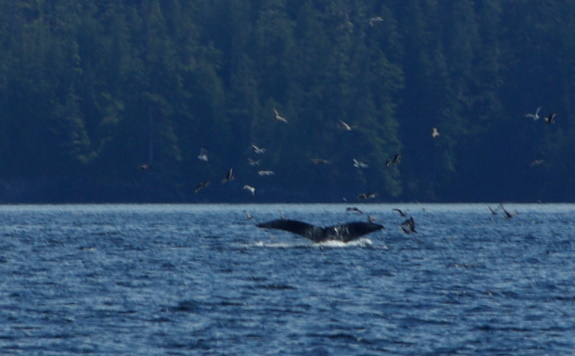 – We had a great day of sailing in Queen Charlotte Strait, complete with whale watching. There was very little swell in the Strait that day, but a good 15 knot NW wind. 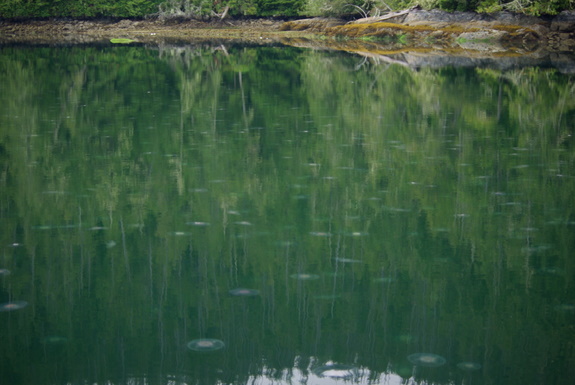 – Joe Cove at Eden Island was interesting because it was filled with jellyfish! 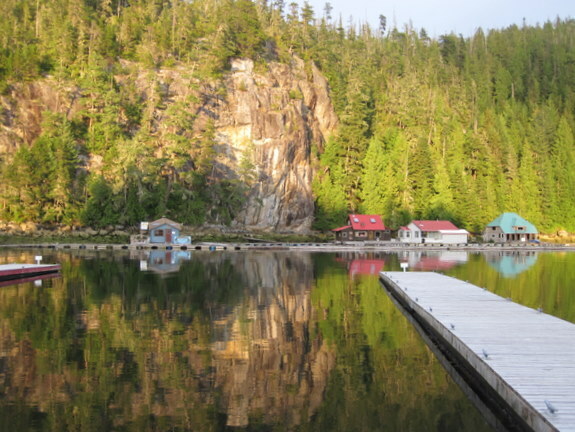 – We went to Pierre’s Echo Bay for provisioning. Pierre has a well stocked store. Their tap water is dark with tannins. 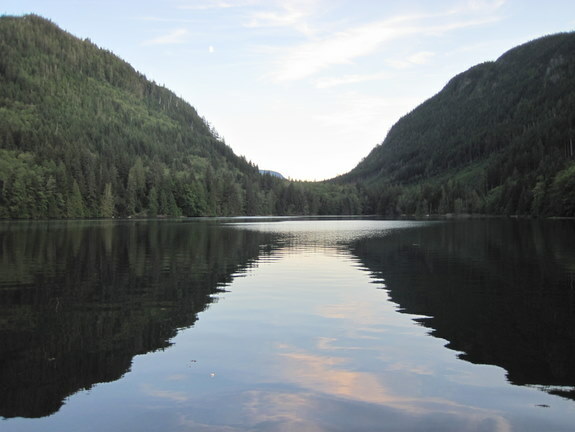 – And finally, we spent our last night in the area at Cutter Cove, at the north end of Chatham channel near Knight Inlet. It is supposed to be a well-sheltered cove but we experienced gusty 15 knot winds. Plenty of swing room, and our anchor held, but it meant we didn’t sleep well. When we left the next day, we got up in the dark at 6AM, and set off in the rain and fog so we could reach Root Point at slack. We then motored in the fog to Port Harvey, and anchored for a few hours while we decided whether we would do the return trip along Johnstone Strait on such a rainy foggy day when there was strong NW wind warnings forecast. 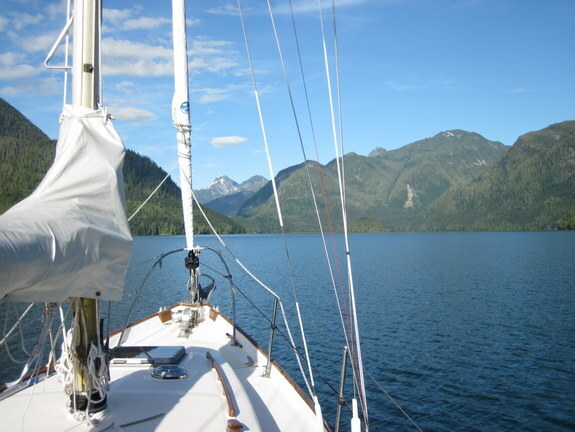 In the end, we went for it, which was a good thing because it was the last NW wind I heard forecast for Johnstone Strait for the next two weeks as the bad weather moved in. The day turned out fine, despite our need to use radar for the first few hours. The Broughtons and surrounding area is definitely a place we want to visit again. It is extraordinarily beautiful. This bay off Havannah Channel is a classic U-shaped glacial valley. It was gorgeous! A large school of these guys swam nearby for maybe 30 minutes, fishing and making quite a lot of noise. Just off Tribune Channel, this 4 NM long sound smelled of mountian pines rather than ocean. 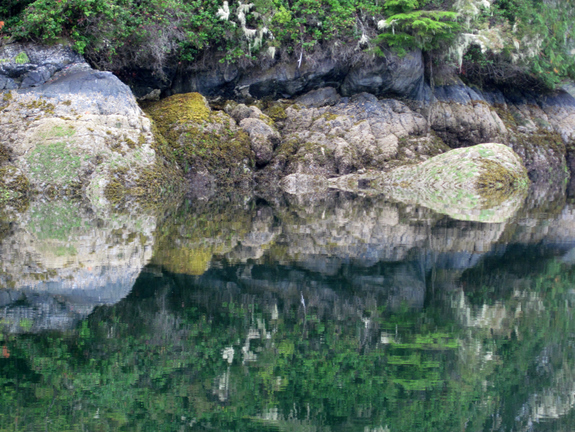 The water at Waddington Bay was clear and smooth, allowing us good viewing of the marine life. 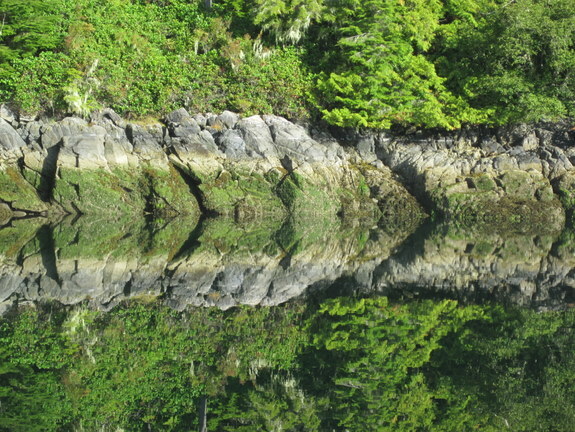 The mirror smooth water at Waddington Bay provided startling reflections. 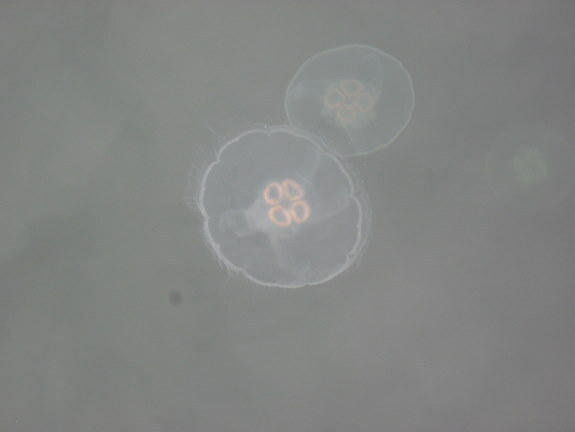 I see a pufferfish in this one, do you? 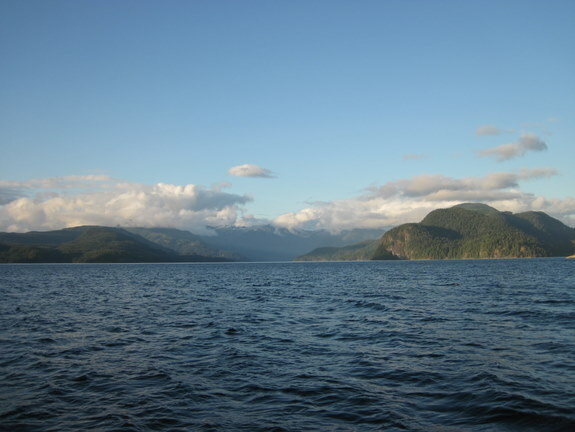 A view of Vancouver Island, and evidence that the weather was changing (for the much worse). The telltale sign (and sound) of whales nearby. 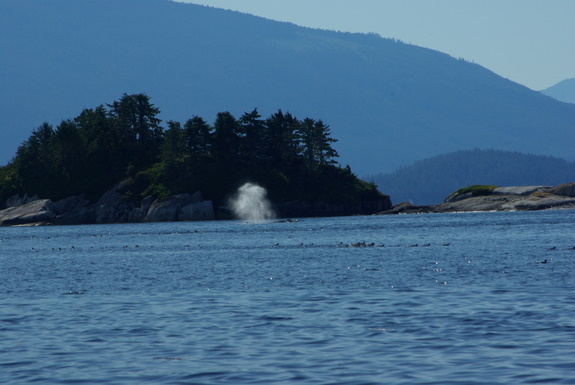 There were several grey whales in Queen Charlotte Strait. This cove at Eden Island was filled with Jellyfish. Notice all the semi-transparent white circles in the water? These are about 6-8″ in diameter, and move so gracefully. Even the marinas in the Broughtons are beautiful! 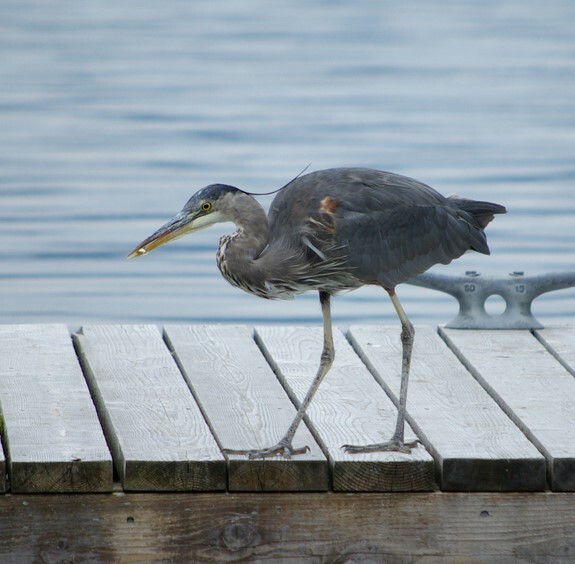 This heron was fishing from Pierre’s Echo Bay marina dock.